My sister and my mom came over last Monday as it was a holiday, and we thought it a good time to go to the outlets by my house. We had a lot of fun, although we carried SO MUCH stuff as my sister has the twins who are now 9 months old, and I had of course baby Kiya. We walked around the outlets and got some really good deals...we also got a lot of stares as we had a double stroller and then my stroller. Finally a gentleman came up and asked if they were "all in the same family". We explained that they were the same family, but cousins so not the same parents. He just looked at us, shook his head and said "You sure do have your hands full". I thought "and we don't even have Caiden with us right now". 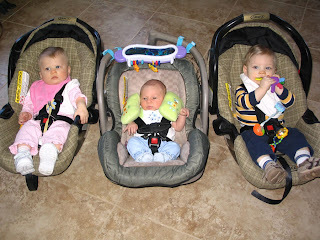 We had to stop often to attend to the various baby needs. 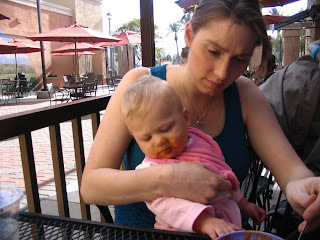 As you can see here, Lindsay really enjoyed her lunch...getting orange ALL over herself and everything around her. Lunch was interesting with three kids as we had to take turns eating. 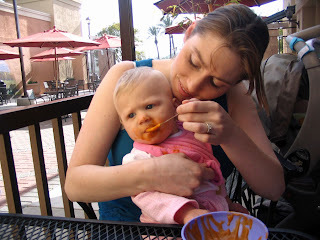 I fed Lindsay while my mom fed Kyle, while Stephanie went to make sure that the food we ordered was coming. When my food came out first we did a bit of a musical rotation of children until Kiya demanded to be fed, then we rotated again. Quite comical. I had a lot of fun, but had to run as I had a meeting for dinner with my new boss who was in town. It was nice to have my sister and mom come out, and I hope they do it again soon. Our family is sure expanding. In a few months, we will have 4 kids in the family under the age of 1, with my sister's twins, Kiya, and then Pam and Jacob's new bundle of joy. The family is continuing to grow, but I am loving every second of it. Tell Lindsay not to worry that is how I look when I eat my lunch too!! That sounds like fun. You are making me miss my family down there.